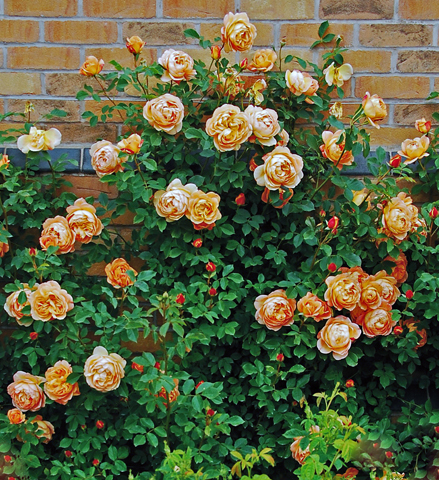 As with all roses, regular routine pruning will help to keep them healthy and floriferous. Failure to prune can result in untidy unhealthy poor flowering plants. Shrub roses are usually larger than modern hybrid bush roses and have thornier stems,making them usufull subjects for hedging. Shrub roses, unlike modern hybrid bush roses, generally flower on older wood so when pruning, aim for a balance of old and young wood. The often scented flowers may repeat flower, or flower only once in a growing season. Pruning plants that flower only once, is slightly different to that of repeat flowering varieties. Prune in late summer once flowering is completed. Remove dead or diseased wood, including any unproductive wood from the centre of the plant. Remove crossing branches,and spindly growth. If the plant is becoming a bit leggy, or bare at the base, cut a few stems back to near ground level,this should encourage new growth from the base of the plant. The aim is to have a balance of old and young wood. In late winter prune back the previous season’s growths by up to 50 percent of their length. If the plant is becoming somewhat mis-shapen or too dense reduce the new growth by up to one third. Finally, shorten strong sideshoots to two or three buds. As with single flowering varieties, if the plant is becoming a bit leggy, or bare at the base, cut a few stems back to near ground level,this should encourage new growth from the base of the plant. The aim is to always have a balance of old and young wood.